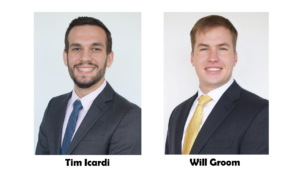 THF Promotes Will Groom and Tim Icardi to Senior in the Tax Services Department! THF promotes Will Groom and Tim Icardi to Senior within the Tax Services Department. Will joined the THF team in September 2016. His current responsibilities include the preparations of C-Corporation, S-Corporation, partnership, individual, not-for-profit, and state tax returns. Will graduated with a bachelor’s degree in accounting and finance followed by a master’s degree in taxation from Florida State University. Tim started at THF in January 2017 in a part-time capacity in the tax services department and transitioned to a full-time position in June 2017. Industries served include insurance, individuals, partnerships, and corporate tax returns. Tim graduated with his bachelor’s degree in accounting and master’s degree in accounting from Florida State University. Will and Tim are both CPAs and are members of the Florida Institute of Certified Public Accountants (FICPA) and the American Institute of Certified Public Accountants (AICPA). THF congratulates Will and Tim on their promotions to Senior.